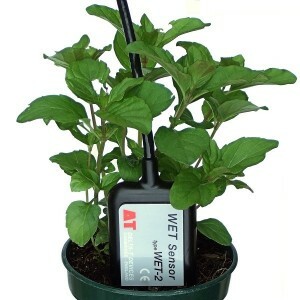 The WET Sensor has crucial applications in precision horticulture and soil science research and is usable in both soils and growing substrates. It is exceptional in its ability to measure pore water conductivity (ECp), the EC of the water that is available to the plant. Where plants are grown in artificial substrates using hydroponic or fertigation systems, nutrients are routinely supplied in irrigation water. Nutrient levels are controlled by monitoring the water content and conductivity (EC) and adjusting the injection of liquid fertiliser into the irrigation water. The Delta-T Devices WET Sensor excels in monitoring this crucial information. Nutrients are sometimes provided by fertigation but are often provided by Controlled Release Fertilisers (CRF). The rate at which these are taken up depends on several factors, including the weather conditions and irrigation regime. The Delta-T Devices WET Sensor can be used to measure the EC within the growing media and so take much of the guesswork out of this process. If the irrigation water is recycled or abstracted from rivers and aquifers with high levels of dissolved salts, over time there can be a build up of soil salinity. Soil salinisation will eventually reduce crop yields. The WET Sensor is fast and efficient for sampling soil salinity, ensuring that farmers have the essential information they need to take remedial action as quickly as possible. 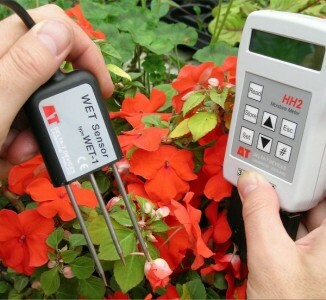 WET Sensors are normally ordered as a complete kit that includes a WET Sensor, an HH2 Moisture Meter and a handy carry case. There are three types of Kit - each with a different set of substrate calibrations.